Alberta’s energy future is complex. The global oil and gas sector is in the midst of profound change, and markets will continue to fluctuate over the coming decades, as the world’s energy systems undergo game-changing technological and political shifts. All of this is felt acutely in Alberta. Credible climate policy is the same as good economic and social policy: it enables Alberta to be competitive, attract investment, spur innovation and remain a supplier of choice in the global energy market. Alberta’s future as an energy provider is directly linked to an ability to demonstrate a demand for its products in a decarbonizing world. This week, Alberta’s two major political parties unveiled platforms for the upcoming provincial election, including details on energy policies. We are glad to see both include specific platform details related to climate action, in order to properly evaluate the effectiveness of each party’s proposed climate and energy policies. It is an essential issue that is already impacting Albertans, and is critical to the success of Alberta’s future. All parties need to be diligent in helping realign our province’s priorities in order to remain competitive in a lower carbon world, contribute to meeting Canada’s climate commitments, and help mitigate serious impacts of climate change on Albertans’ quality of life. Alberta’s emissions currently represent almost 40 per cent of Canada’s total, and our research shows if the province continues according to “business-as-usual,” it could represent nearly double the emissions targets the entire country is striving to meet. It is critical we all work to reduce greenhouse gases. This requires an economy-wide plan with climate policies that drive Albertans’ innovative spirit, and find better, more cost-effective technologies and business strategies that reduce emissions, while creating economic, social and environmental value. To this end, as we’ve previously noted, an economy-wide price on carbon is an essential tool. It provides both incentives and funding that help families, small businesses and our key industries make lower-carbon choices, without inflexible regulations. There is a reason why business leaders, political leaders across the spectrum, and economists agree widely that carbon pricing it is the most cost-effective way to reduce emissions: because it works. Alberta’s current carbon pricing system is economy wide, meaning everyone – from individuals to large industries – who generates carbon pollution pays a related levy. Alberta’s policy framework uses some of that revenue to help those with fewer resources adapt to those increased costs, by providing household rebates and small businesses tax cuts. More importantly, remaining funds are funneled into programs that help everyone – families, small businesses and large industry players – make lower-carbon choices, which in the long run, save people money and further reduce pollution. In 2017 to 2018, that meant $676 million was reinvested to support green infrastructure, coal phase-out, energy efficiency, renewable energy and clean tech innovation. These key programs benefit all Albertans, economically, socially and environmentally. Rejecting a price on carbon pollution is walking away from a proven, lowest-cost way to address climate change; Alberta should continue, growing the program predictably. Industry-specific policies spur innovation while driving emissions and costs down across. We have previously written about why the Carbon Competitiveness Incentive Regulation (CCIR) program is a more effective and fairer system than its predecessor, the Specified Gas Emitters Regulation (SGER). In the oilsands, reducing emissions and strongly promoting decarbonization is crucial for the industry’s future success, as global energy systems continue to shift towards low-carbon supplies. Reverting to a system resembling SGER will punish companies who have invested and innovated. This is a damaging signal to send, because those are the companies who are better positioned for success in a low-carbon economy. We recently unveiled our Alberta Energy Policy Simulator, an open-source interactive tool built on public data. The online simulator visually models the effects different climate policies could have on reducing emissions, and tests for other considerations like cost and health impacts. The modelling clearly shows that, of all climate policies currently in place, strong carbon pricing applied across the economy gives us the most emissions reductions for the least cost and disruption. Carbon pricing will need to be combined with other sensible and credible policies such as coal-phase out, methane reductions, and building efficiency standards to further move our province towards decarbonization. 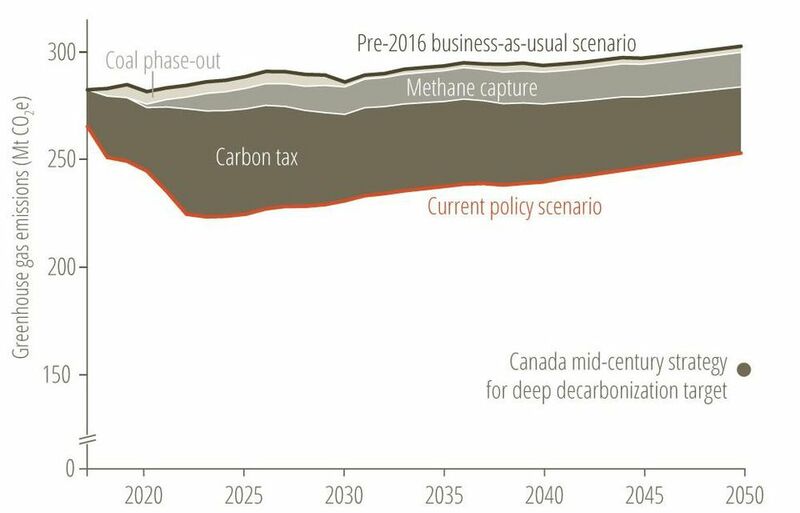 Modelling proposed platforms on our simulator also shows the NDP’s proposal will result in significantly lower emissions over time, but does not reduce them enough to meet national targets by 2030 or Canada’s mid-century target by 2050. Meanwhile, the UCP’s platform scraps economy-wide coverage that will result in significantly fewer reductions than existing policies, commits to marginally small reductions in only the oilsands and electricity sectors, and postpones most improvements until the latter part of the next decade. Both parties need to commit to more to protect the current and future interests of Albertans, and prepare the province for a 21st-century economy. 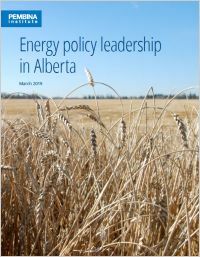 Earlier this month, the Pembina Institute released its vision for Energy Policy Leadership in Alberta, which outlines key policies needed in Alberta. All parties have a responsibility to support energy policies that prepare Alberta for the changing world, reduce emissions in a fair and cost-effective way, spur innovation, and most importantly, recognize that economic and climate policies are one in the same. Anything less is short changing Albertans. Tags: Alberta, Provincial Policy, Elections. Alberta has had a price on carbon pollution since 2007, beginning with the Specified Gas Emitters Regulation (SGER), which paved the way to the stronger system now in place under Alberta’s Climate Leadership Plan (CLP). That Alberta’s oil industry has been permitted to accumulate either tens or hundreds of billions of dollars in cleanup costs over the last several decades is problematic in itself. But the more immediate problem, one that should concern Albertans of all ideological and political affiliations is the gross lack of transparency on the level of risk facing taxpayers, who could be left on the hook for a portion of that cleanup bill. Alberta surprised the world last month when it announced the legislative protection of nearly 1.4 million hectares of land. This represents the world’s largest boreal protected area complex.